The gender wage gap is a complex and frustrating phenomenon. One thing we know for sure is it that while the gap is narrowing, it’s doing so very slowly. At this rate, the Institute for Women’s Policy Research predicts women won’t see equal pay until 2058, nearly 100 years after the Equal Pay Act was signed into law. With women today making only about 78 cents on the dollar, many are asking why the gender pay gap has subsisted for so long. Based on recent studies, the root of the problem extends beyond the workplace to the average American household. Some have called it the “chore gap,” but maybe the “time gap” would be more accurate. In 2015, NerdWallet analyzed data from the Bureau of Labor Statistics American Time Use Survey, assessing what activities each gender spends more time on and how income level impacts those results. Americans might like to think gender roles have come a long way, but they are still largely dictating the division of labor at home. The analysis shows that women across all income levels are still spending more time than men with children, preparing food, and cleaning. Men on the other hand, spend more time doing yard work. It’s not just about who does which chores. It’s about how men and women spend their time and the value associated with that time. After all, time is money. Women who spend more hours doing domestic activities than their male counterparts are missing out on potential earnings. At the same time, it is much easier for women in higher income brackets to spend more time in the workplace or enjoy leisure activities. Even if a woman in this situation is single or her partner works full time, she can afford to hire help for childcare and household chores. NerdWallet published the following infographic highlighting its findings for women of lower and higher incomes. 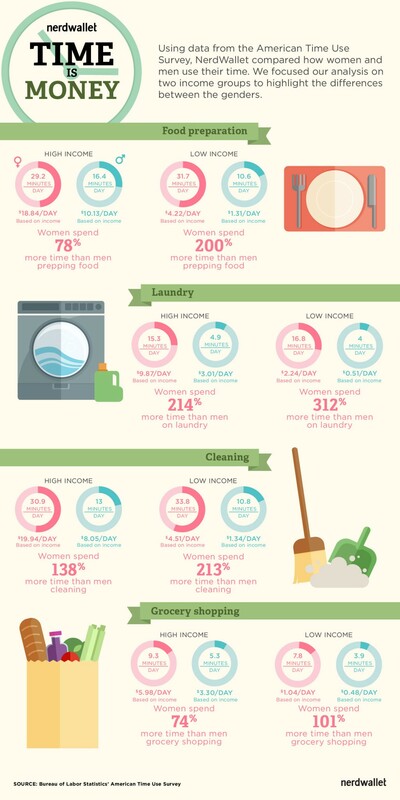 According to data gathered in the American Time Use Survey, low-income women spend even more of their time on food preparation, laundry, cleaning, and grocery shopping than women who are affluent, but for both groups of women, there is still a dramatic time gap when compared with men. One would think American families would have made more progress by now in tossing out traditional gender roles, but there is an enduring disparity even in the way male and female children are raised. For example, research shows boys are more likely to earn an allowance for doing household chores than girls, but girls tend to spend more time doing chores, suggesting the gender pay gap truly begins at home. Parents also spend more time teaching boys about money management, even though girls are more apt to request those talks. One reason people say the wage gap persists is because women demand more flexibility to raise kids and tend to family responsibilities. Even if that’s true, it may not be a choice. American women are still brought up believing they need to be more concerned with children and the home than earning money. And for single mothers, there’s no choice at all. Low-income women seeking to break the cycle have more trouble than affluent women. They are responsible for more housework because they earn less money, yet they earn less money because they spend more time at home. Perhaps what’s most maddening about the gender gap issue is that it can appear to be a chicken-or-the-egg situation: Women won’t see equal pay until American households evolve, yet American households are stuck conforming to tradition because men earn more money. The bottom line is a woman’s time is valued less than a man’s, and that needs to change. When we’ll truly see that change remains to be seen, but let’s hope it’s before 2058.